How does our healthcare stack up against the rest of the world? As we think about the possibility of moving to some version of Single Payer, we have to look at all sides of the question – what do we pay, what do we get, and how is that working for us. Let’s start with a quick snapshot – we pay twice as much as the average country, to get results that are generally worse than average. Would your business survive if you delivered these results at this cost? Briefly – we are paying twice as much as the average industrialized country, yet our life expectancy is lower, more of us die from heart disease, far fewer of us have insurance coverage, and too many of us are admitted with breathing problems. It won’t surprise you to see more Americans skipped taking medications because they couldn’t afford them. Add that to the fact that the US has a higher percentage of adults with diabetes than all but two countries, and we know that the prognosis for many of those diabetics is poor. 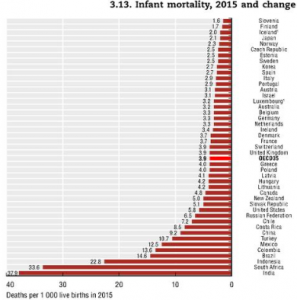 Oh, and more American babies die than in most other countries; fortunately we are just a tad better than Russia, land of alcoholism and awful medical care. 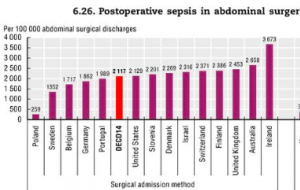 Our surgical infection rates are also average – although we pay way more than they do in other countries. 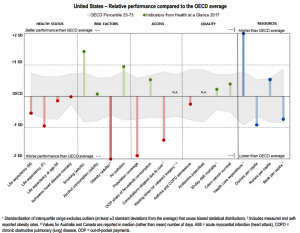 The US healthcare system is delivering crappy results for way too much of our money. Given what we pay, we should have the fewest infant deaths, lowest surgical infection rates, highest medication adherence, and longest and healthiest lives. And that’s exactly why Amazon, Berkshire Hathaway, and JPMOrganChase are taking it on. Everyone speaks to the total expenses. What about the comparison of the income of those working in the medical field in the U.S. compared to these other countries? I don’t believe the cardiac or neuro-surgeon used to bringing home a $1,000,000 income is going to quietly agree to reduce their salary to $100,000/year. Hello Michael – we agree, there’s going to be stiff resistance from some of us who make our living from a bloated and inefficient healthcare system. There is pretty strong support from many younger physicians, especially those in primary care. And as more and more docs are employed by health systems, they will have less say in policy matters. When the market refuses to pay what that doc wants to charge, then the doc can either retire or accept the lower pay. An anecdotal story comes to mind about the difference between American doctors and doctors elsewhere. A relative of mine went to his doctor some years ago, and the doctor, to show off how much money he has, showed my relative his new, very expensive watch. Manufacturer unknown. My relative, however, showed him his watch that he had worn for years and got from his store. My relative was a pharmacist in New York, and carried watches in his front window. They were Timex’. The mere fact that a physician rubs his expensive watch in the face of a patient, is proof that doctors have forgotten their Hippocratic oath and see medicine as a business and not as a calling. Whereas, my relative, who was in business, had a inexpensive, and durable watch for many years. Thanks for sharing this information which succinctly portrays our shameful health care situation in the United States. There are many reasons why our costs are excessive and our health is poor; however, financial greed and self-interests are often at the core. There are marked inefficiencies (in part, because difference components make money from these inefficiencies), payment is typically based on procedures (rather than listening and education), excessive diagnostic testing because of fear of malpractice, failure to consistently use evidence-based medicine, over emphasis on use of drugs (reflective of the interests of Big Pharma) rather than wise lifestyle choices (diet, exercise, not smoking, etc. ), influence by fast food companies and other food manufacturers (encouraging unhealthy dietary choices), and a myriad of other issues. We need a single payer system; however, with all of the self-interests I do not know how that will be achieved. We also need an emphasis on “living abled and healthy” with core principles illustrated at http://www.livingabled.com. To start, we must recognize that the situation we have now is not tolerable and is too costly – both financial and personal (as it relates to our well-being). I appreciate you taking a stand, as well as Amazon, Berkshire Hathaway, JP Morgan Chase and others. Dr Brigham – thanks for the thoughtful comment. Like you, I wonder why so many of us decry efforts to ensure more Americans have access to high-quality healthcare. I’d suggest that those who protest reform come up with solutions to the current mess of a healthcare system we have. If they are not part of the solution, they are not helping solve the problem. Scott – thanks for the link. Did you have a chance to read the opinion column cited? If so, I’d be only to happy to discuss specific assertions made by the authors. I would note that several of their claims are anecdotal, and none address the fact that we pay far more for care that is demonstrably worse across most metrics. I note that the authors specifically address social determinants of health as a key “reason” our outcomes are so much worse than other countries’. One example of the authors’ obfuscation: yes our obesity crisis drives diabetes, however our healthcare “system” is responsible for dealing with the fallout, changing behavior, fixing the disease. Which it is not doing well. The post shared by you is very unique, you have compared the health care report of united states and the whole world which is really very informative news. Please share some latest news in future. Thank You! Previous Previous post: What exactly is “Single Payer”?